Going into Ironman Oceanside, I didn’t really know what to expect from my performance level. Our whole family had been fighting illness for about a month. I had managed to avoid the first round of illness, but I guess my body gave up the second time something went around a couple weeks after. 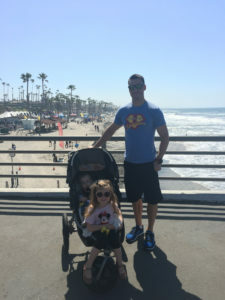 This time, when I got sick, I decided to take 4 days off from training, which was the week before Oceanside. If anyone knows me, they know I never give up training. I pretty much push through no matter what. So this just shows how run down I was feeling. Thanks preschool/swim class/dance class/kids parties. 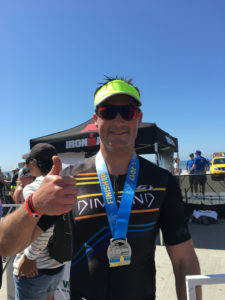 So my race was going to be great, because I got some extra rest, or not so great, because I didn’t get in all my training or really do any race efforts to feel confident during Oceanside. 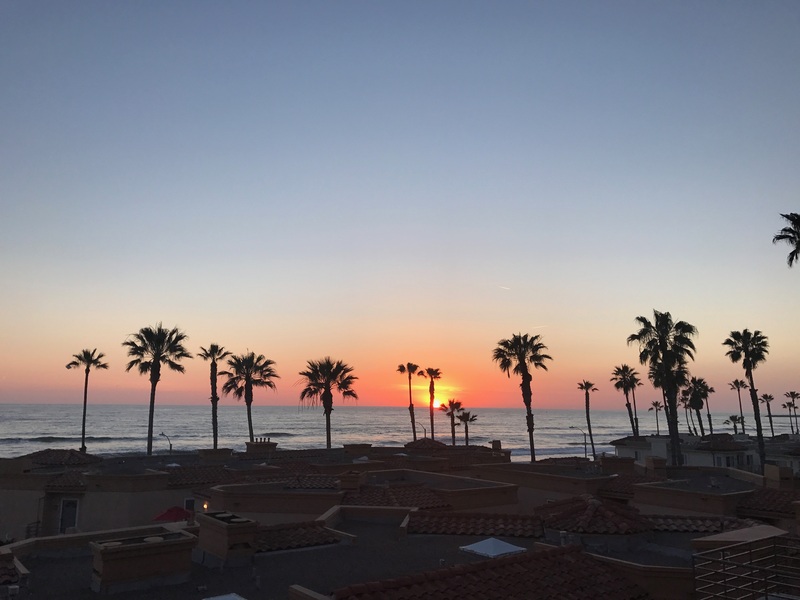 Either way, I was happy to reach Oceanside healthy and optimistic. This was also to be my first race is the 35-39 age-group. I’m officially middle-aged. Scary. So while, I was feeling a bit run-down, my age-group was becoming more competitive. It’s amazing how endurance athletes get stronger with age. I always think of Oceanside as a close destination race. But the reality is, it’s just as hard logistically as any race in the US. It’s just far enough away where it’s a really long drive and can’t be done in a single day (with kids anyway), but close enough where it’s debatable if it makes sense to fly. So I ended up driving by myself down to Los Angeles on Thursday before the race, where I would pick up Camille and the kids from LAX. This allowed me the ability to drive my bike down, while Camille could still work on Thursday and have a very quick flight from Monterey with the kids. We stayed the night in Anaheim near Disney before making the rest of the drive to Oceanside on Friday morning. 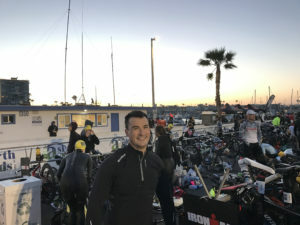 Friday before the race was spent doing the normal administrative tasks of athlete check-in, setting up all my gear and dropping my bike off in transition, plus the Ironman kids race. We ended up getting a hotel last minute in Oceanside right at the pier even though Camille has family right next door, due to our collective questionable contagiousness. Having a hotel was really nice as Iyla got some time in the pool, and I got to relax in the room a bit while Caden took his nap. We ate dinner Friday night with family and went to bed at our normal time of about 9pm. My alarm went off at 4:30am. I bit earlier this year because I wanted to get to the start earlier to get a good spot in line as the race moved from a wave start to a rolling start. Since the kids were still asleep in the same room, I had to quietly sneak to the bathroom and close the door. I had all my gear and breakfast already laid out inside the bathroom where I hung out the next 45 minutes, trying not to make too much noise. I had even brought in the coffee pot to brew some coffee for myself. Good thing the bathroom was pretty oversized. Breakfast was granola with milk, a banana with nut butter, and a good amount of coffee. After breakfast, I started on my 20 minute walk to the harbor and into transition. I felt like a baby hanging out in transition because I was so cold. I was jumping up and down and doing whatever I could to stay warm. I should have brought a thicker jacket. I ended up putting on my wetsuit and then a sweater on top of that to keep warm. Must be my old age. When it was time, I made my way to the starting corral and as close to the start of the line as possible. I tried to put myself near the 30-minute swimmer position. I figured this would be a good place to be and avoid some of the crowds on the bike. The swim start was anticlimactic, as if often the case with a rolling start. I slowly walked down the ramp and into the water before diving in and starting a quick, hard effort. For the first few hundred yards, I had a hard pace going. After a few minutes of that, I knew I was going to need to slow down. 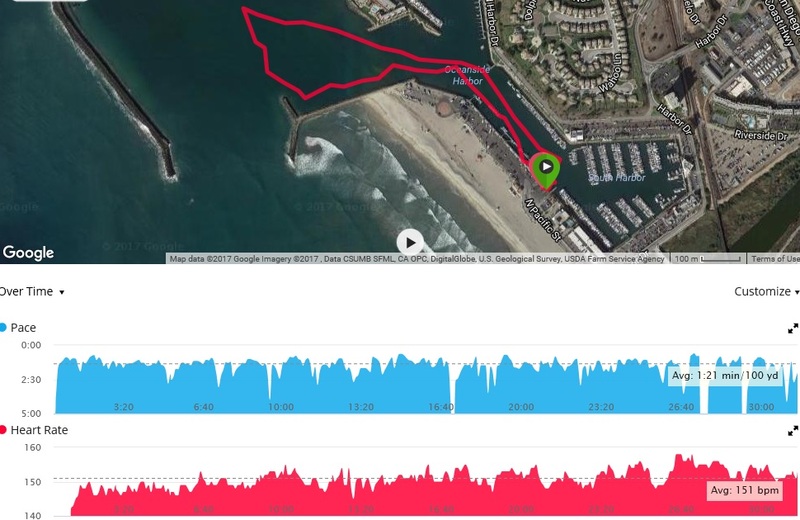 I settled into my normal 70.3 swim pace and tried to just focus on my stroke. During the first third of the race, there wasn’t too much contact with other swimmers. Most people around me were about the same pace, so we didn’t bump into each other too much. After a few more minutes, we did start running into the back of some groups of swimmers, which made the swim a bit more challenging. Overall, the first half of the swim was somewhat uneventful and I tried to focus on not swallowing any of that harbor water. When I finally got to the turnaround point to swim back into the harbor, the sun was really in my eyes, and it was really challenging to see anything when trying to sight. I remembered this from previous years, and even with tinted goggles, I still couldn’t see other swimmers or the course buoys. I just had to look to the side and try to navigate based on objects to the side of the course. This made the swim back feel much longer than the swim out. I finally made it back deeper into the harbor and was able to finally see the swim exit. I pushed a bit harder just to finish up the swim and was finally at the ramp and running across the timing mat. I forgot how long of a run it is from the water to transition. It felt like forever before I finally got to my bike. Changing into my bike gear took forever because I’m really slow at getting my wetsuit off. While most people can strip it off at a blazing speed, I have to sit on the ground to get the suit off my ankles. With the added time it takes to put my socks on wet feet, I have some horrible transition times. I finally was off running with my bike out of transition and to the mount line. The first few minutes on the bike, I just tried to focus on settling into my position and getting my heart rate calmed down a bit. I then took some sips of water to get the taste of harbor out of my mouth and settled in to find my power. My legs felt really stiff and tight right away. Trying to hold my power goal was more challenging than I wanted. This can be normal at the start of a race, so I hoped my legs would come back to me and it would be easier to hit my goal power numbers. The bike course was also busier than I had hoped. I thought that by starting the swim sooner, I could get some cleaner road on the bike. But it was still pretty crowded. I personally like to just zone out and focus on riding, so the extra riders around me made it more challenging for me to stay mentally focused on my own race. I really enjoy the bike course at Oceanside. There is always something new to look at and it’s easy to mentally break the course apart into smaller sections in order to pass the time. I also like riding on base a lot. There isn’t really any car traffic and it’s fun to look around at all the base infrastructure. By the time we got into the hills on the base, I was still riding at a lower power than my goal. I hoped some of the uphill would help me increase my overall average power, just so I could feel like I was able to hit my goal. During each uphill, I was able to take in some food and also stretch my back a little. What I really like about 70.3 races, is all the leg distances are very doable. I can do a 2.5 hour bike ride in my sleep at this point, even with a heavy power goal. So the time and the miles went by really quickly, and soon I only had a flat 10 miles before the finish. 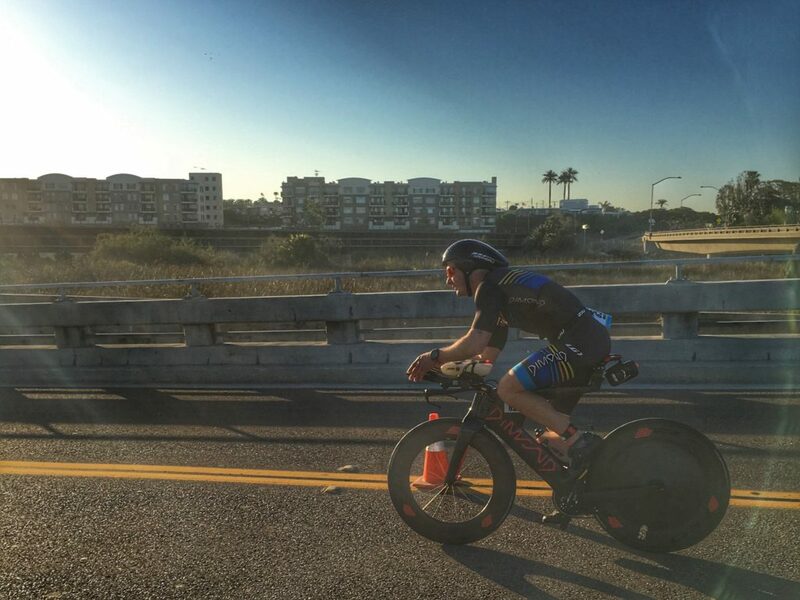 I focused on staying as aero as I could and tried to keep my power up, even though it was somewhat fading and I was getting somewhat uncomfortable on the bike. I was looking forward to changing it up and seeing what would happen on the run. I finally made it back into transition and was able to get off my bike and put on my running shoes. After a quick bladder break in transition, I was off on the run course. The run course at Oceanside it probably my favorite. It’s along the beach, it’s flat and fast and the crowds are awesome. It’s also really easy to break into sections in order to set small goals, and each section feels very doable at only a couple miles. I checked my pace as I ran from the harbor and was somewhat disappointed to see that my selected pace was a 7:15/mile instead of my goal 7 min pace. Last year, I was running 6:50 pace pretty easily out of transition, so I knew it may be a slower run just from the initial feel. Also, my lower back was throbbing right away. 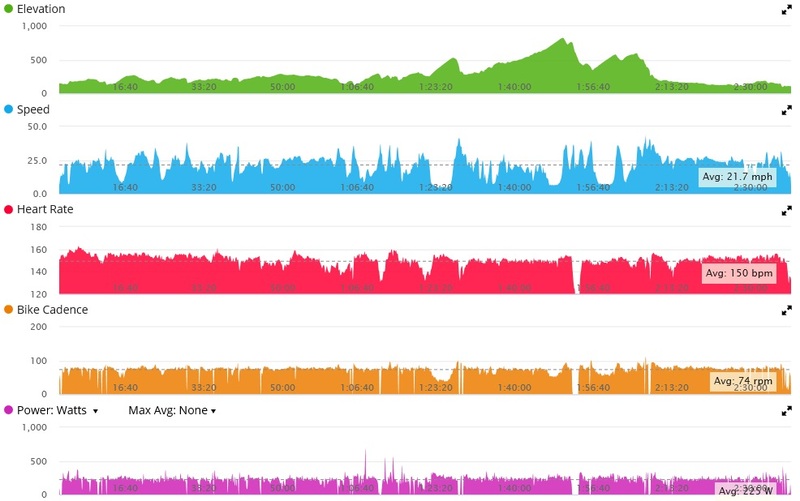 I had played a lot with my bike fit on my own and maybe didn’t get it quite right, which probably hurt my run. Besides the slower pace and back issues, I was still in good spirits and enjoying the run. I was able to hold on to the 7:15 pace for the first whole lap, which was promising. At least I wasn’t slowing down much, even though I wasn’t going as fast as I wanted. At each aid station I would do water over my head and drink a small amount of coke. On the second lap, I started to really feel less energized and I just kept thinking about making it to my next small segment of the run. My pace had slowed to around 7:20 or slower, but at least I wasn’t miserable, like during an IM run, and I was still enjoying the overall experience. I just had to keep reminding myself to hold on and keep going the last few miles. It’s a great feeling to make it down to The Strand for the last time and see the pier and finish in the distance about a half mile away. I gave it one big push the last straight away. Definitely, one of my favorite race finishes with the crowds lining the road the last few hundred yards. I crossed the finish with my heart in my mouth, trying to hold on to that last push. I definitely didn’t hit my goal this race. I’m okay with that because I’ve been pretty consistent with all my racing so far, so having an off day is fine by me. And my off day, was just a little off, enough to be noticeable and to bug me, but not enough to really complain about. But it is amazing how little misses in goals can aggregate over a 70.3 distance. I really look forward to my next race to see how I can improve. I’ll need to stay healthy before the race, fix my bike fit, and keep working on fitness in order to be successful next time. I’m glad Oceanside was a fun trip with the family and another great learning experience.